On the initiative and at the invitation of Dean of the Department of Philology prof. Yaroslav Yaremko on March 2, 2017 the delegation of East European higher public school in Przemysl headed by their Rector, Dr. Pawel Trefler visited our University. First meeting was held with the participation of Vice-rector for scientific and pedagogical activities Assoc. Prof. Yuri Vovk, Prof. Yaroslav Yaremko, Prof. Lesia Kravchenko, Assoc. Prof. Stephen Senkiv, Assoc. Prof. Vasyl Zvarych, Assoc. Prof. Vira Meniok. They discussed the development of Polish philology at the Department of Philology, where it started in the University and has been licensed as a major at the bachelor and master level. 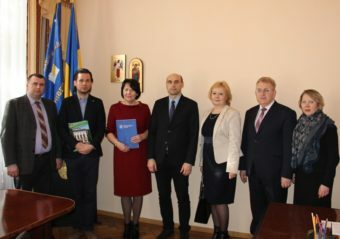 They also discussed the prospects of exchange of Polonistics students from our university and students of the Ukrainian language at the Eastern European higher public school in Przemysl, participation in joint research projects of the students and faculty of both schools. Then a delegation of Polish colleagues visited the department of world literature and Slavic studies, which teaches Polonistic course. Subsequently, our Polish partners met with the Rector of the University Prof. Nadiya Skotna. 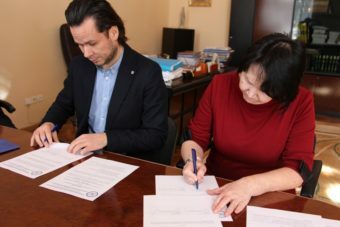 They signed an agreement on collaboration between Ivan Franko State Pedagogical University, Drohobych and the East European higher public school in Przemysl. Now we have another Polish partner and are looking forward to a successful development of our cooperation with them. (left to right) Assoc. Prof. Yuri Vovk, Dr. Pawel Trefler, Rector of the University Prof. Nadiya Skotna, Prof. Piotr Dlugosz, Prof. Lesia Kravchenko, Prof. Yaroslav Yaremko, Assoc. Prof. Vira Meniok.